It's a little past midnight here in the "Amateur Sports Capital of the World" (Indianapolis for the uninformed), and several hours ago this was the scene for my talk to the Indy ALT.NET user group. The ALT.NET user group is still very young (this was their 3rd meeting), but it's already got a great active base of members. The meeting was lively with good audience interaction, and- despite a few "predictable" demo glitches- the talk went very well. Thanks again to everyone that came out tonight and for proving that ALT.NET developers really aren't that mean. As promised in my announcement of this trip to Indy, my talk tonight focused on showing you how you can leverage many open source .NET tools (like NHiberante, LinqToNHibernate, NAnt, NUnit, NHibernateDataSource, and Dynamic LINQ) in conjunction with the latest features in RadGrid for ASP.NET AJAX (like client-side data binding , web service integration, and LINQ support) to build a demo app with an architecture much more fit for "real world" use. The result is a demo with a powerful data architecture that helps you see how to build a "better" practice (I'm not the person you should look to for "best" practice anything) application with Telerik's tools. Since my demo code uses features coming in next week's Q2 2008 release, I can't make it available for download yet- sorry! In the mean time, you can grab the slides from tonight's session below, and as soon as the Q2 2008 release is public, I'll publish the code here for you to download, too. I hope you enjoy the resources. Watch for a "re-play" of this session at my future conference appearances and maybe even a webcast version. Anyone interested? If you're ever back in the Indy area for any reason, look me up! Any chance of having the demo available for download? @Asit- Absolutely! The demo code will be available soon after the Q2 release next week (since it uses the new Q2 assemblies). Check back then and the "Code" link will deliver what you want. Could you also share HelpDeskBeta2 database? 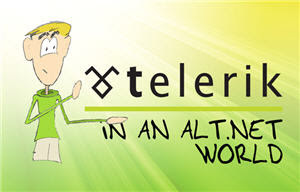 It is no more available for download via Telerik page (there is only HelpDesk2 DB, which is not compatible with your code).